Ruf currently sporting a 15-game hitting streak. 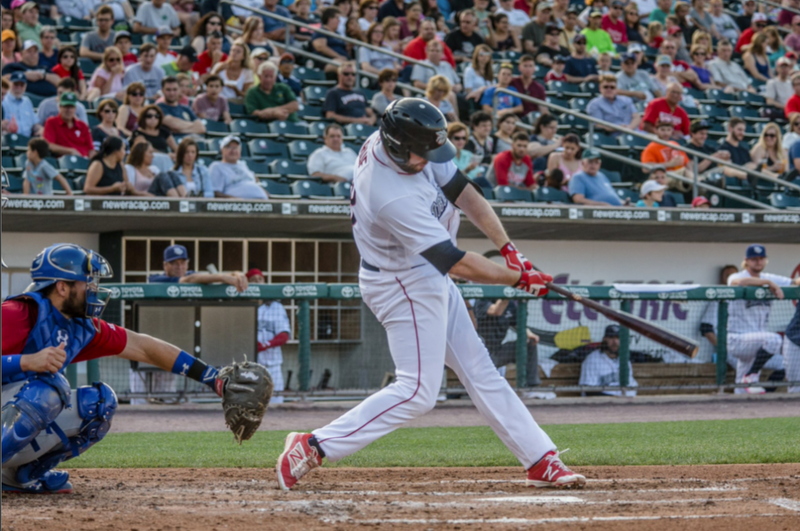 The IronPigs return home tonight for the first of two with P’tucket, just off a 6-game road swing. They creep towards the playoffs continuing to play middling .500 ball. They were 3-3 on the road trip. They were 3-3 in the six games leading up to the road trip. They were 3-3 on the six-game home stand prior to that! Overall, they are 14-14 in August! Will it be enough to win 3-of-5 in a playoff series with Scranton? We shall see–we’ll need to make sure we can beat Rochester first. More on that tomorrow. The deficit to Scranton is now 4.0 games; the lead in the wild card is now 3.5 over Rochester. We’re riding a wave of mediocrity towards a potential post-season bid. Nevertheless, the wins on the road trip clinched the best season ever for the IronPigs (percent-wise) and tied for the most wins ever (2011) and clinched the most road wins ever (42). It’s been a successful season, but how we remember it will ultimately be decided by what happens over the next week–or two or three. No roster moves to speak of right now; however, it has been said in Philadelphia that the Phillies expect to call up two relievers on Friday (9/2). If it’s a lefty and a righty, that’s probably Araujo and Garcia, our two best relief arms right now. Or, they could raid Reading for one (Cordero) and us for the other (Schuster) or something along those lines. If they’re no longer enamored of Hermann, they could return him in exchange, as well. If they take Hinojosa, I’ll consider signing up for season tickets next year or buying a ton of merchandise as a way to thank them. P’tucket returns to town, following two games up there during the just-completed road trip, and three here in Allentown earlier this month. This amount of games in proximity creates some interesting match-up situations. Many seats still remain for tonight’s game. Klein has been a find, since coming over on a waiver claim from Texas. He often uses a lot of pitches and dodges bullets, but has the experience to handle the pressure and perform under adverse conditions. He went 7.2 innings his last time out–against this very P’tucket squad, and allowed 5 hits, 1 earned run, and had 7 strikeouts. Haley has faced Lehigh Valley his last two times through the rotation, getting lit up for 9 runs at Coca Cola Park on 8/17, but yielding only 3 in a 8/25 start in P’tucket. He lost both games, but may benefit some from facing the same team for a third time in a row. Or, will the IronPigs batters benefit from seeing the same pitcher three times over only a couple weeks? That’s the question to be answered tonight. The other thing to watch is how the relievers do after Klein exits. It’s a potential problem I see lurking on the horizon as well scuffle towards the playoffs. No issues to report. It is starting to get cooler later in the evenings, though. In IronPigs Today tomorrow look for a quick preview of the Rochester away-and-home series which will close this season and ultimately determine our playoff fate. Should we be fortunate enough to hold on for the post-season, “Get The Red Out” will be our IronPigs playoff column.